This 2015 summer wedding at Botleys Mansion was a really pretty and summery example of how sometimes less is more. 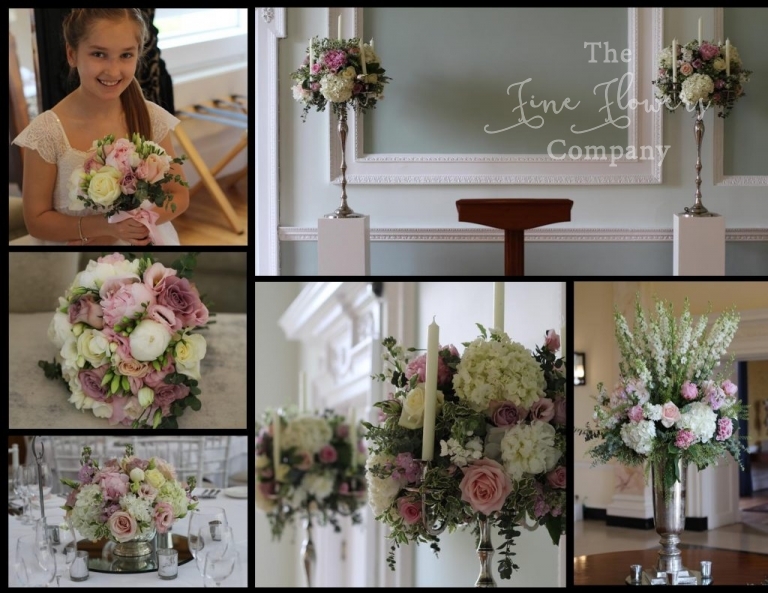 Ann & Peter held an intimate wedding ceremony and reception at Botleys Mansion and wanted to dress the venue beautifully but wanted their venue flower centrepieces to work hard throughout their wedding day to get the most impact possible. I think the result was really pretty and the summery colours look lovely against the light backdrop at this stunning venue. 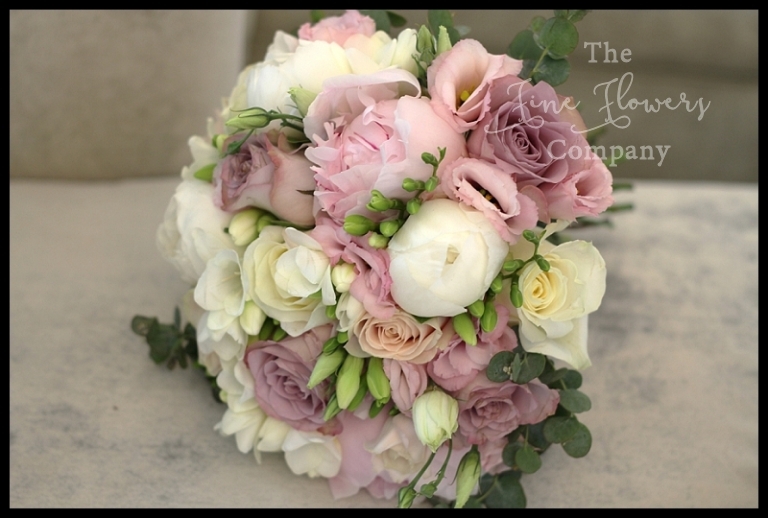 Ann chose a bloomy and scented handtied bouquet of roses and paeonies, scented freesia and lisianthus, with a mellow mix of ivory Avalanche roses, pale blush pink Sweet Avalanche roses, ivory and blush pink paeonies, and a light touch of pinky lilac Memory Lane roses. 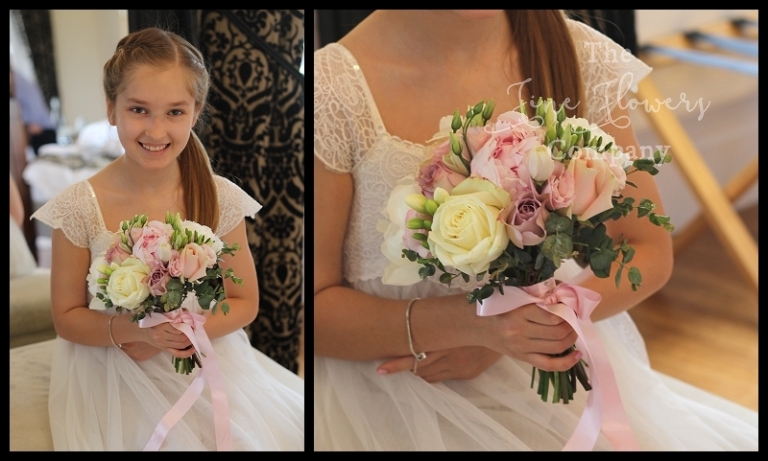 Her beautiful daughter carried a matching posy with long trailing blush pink ribbons and the men wore buttonholes of Avalanche roses, with blush pink lisianthus added to Peter’s buttonhole. 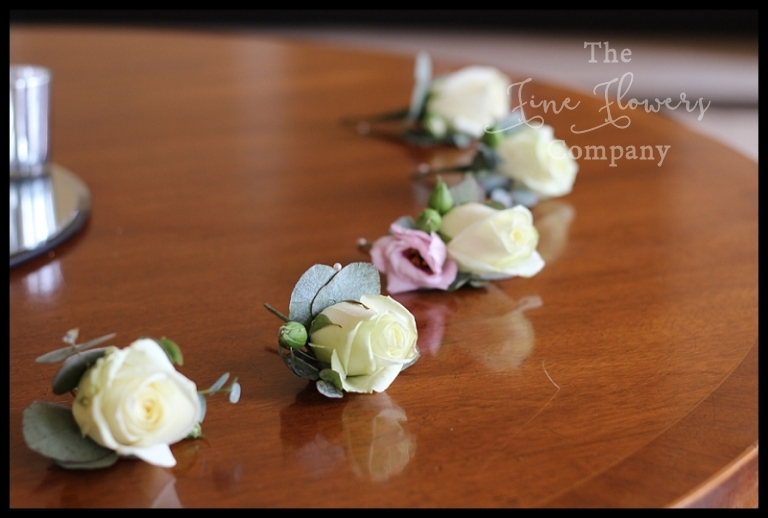 The guests were welcome by a pretty and tall vintage silver urn display of summer blooms on the beautiful round table in the entrance hall, and pretty rose petals scatter lined the aisle and lead them along in the ceremony room. The ceremony area was flanked by 2 of the lovely silver candelabra centrepieces whcih later dressed guest tables in the atrium, and likewise, the ceremony table was dressed with 2 matching silver rose bowl centrepieces later destined for the top table. The result was light and airy and so pretty! Following the wedding ceremony in the Green Room, the wedding breakfast was held in the bright chandelier lit grand Atrium, which was dressed with a pretty mixture of tall silver candelabra centrepieces and low silver rose bowl centrepieces like the ones in the ceremony room. I loved the effect and the scent from the beautiful roses, paeonies and stocks, was simply divine! For more featured weddings at Botleys Mansion please visit our dedicated Botleys Mansion venue gallery pages where you will find many more inspiring wedding ideas in a range of colours and styles to suit all tastes.